Fraxinus ornus L., Sp. Pl. : 1057 1753. Fraxinus montana Salisb., Prodr. Stirp. Chap. Allerton: 14. 1796, nom. superfl. Ornus europaea Pers., Syn. Pl. 1: 9. 1805. Ornus ornus (L.) H.Karst., Deut. Fl. : 1045. 1883, nom. inval. Wallander, E. 2013. 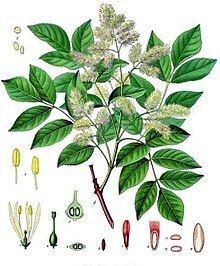 Systematics and floral evolution in Fraxinus (Oleaceae). Belgische Dendrologie Belge, 2012 (2013), pp. 38-58. Pdf:Reference page. Govaerts, R. et al. 2019. Fraxinus ornus in World Checklist of Selected Plant Families. The Board of Trustees of the Royal Botanic Gardens, Kew. Published on the internet. Accessed: 2019 January 30.
International Plant Names Index. 2019. Fraxinus ornus. Published online. Accessed 30 January 2019. For more multimedia, look at Fraxinus ornus on Wikimedia Commons. This page was last edited on 30 January 2019, at 19:55.